Whether you fish in freshwater or saltwater, knowing How to Tie Your Own Bucktail Jigs is an important skill to have. Bucktail jigs are known for catching big striped bass in saltwater. But they can also catch some pretty big bass in freshwater too! So, with all of that aside, why should you want to learn How to Tie Your Own Bucktail Jigs? Well, for starters they catch the heck out of the fish. They also look much different than most of the retail jigs you can buy at stores on online retailers. And learning how to tie your own bucktail jigs saves you a ton of cash. 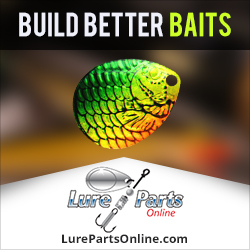 Nobody out there wants to spend more money than necessary on their fishing tackle! You can choose to pour your own lead jigs. Or you can buy them already poured for you. Pouring them yourself saves you money, but it also involves your time and effort. So you will want to decide which works better for you. Either way, once you have some good quality jigs in your hands, then you will need to get ready to start tying bucktail onto them. Learning to tie your own bucktail jigs isn’t extremely difficult, but it does take a bit of practice to get good at it. We’ve taken all of the guess work out of it for you. 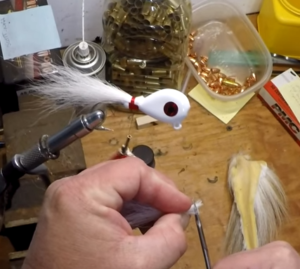 We have included a video below that will walk you through the steps and have you tying your own bucktail jigs in no time at all. Just be patient and take your time. And don’t expect to become an expert overnight. But give it some practice and you’ll soon be doing this like it’s nothing at all. Have fun tying your own bucktail jigs. But most of all, have fun catching fish on them! This entry was posted in Making Your Own Jigs and tagged How to Tie Your Own Bucktail Jigs, making bucktail jigs, Tie your own bucktail jigs, Tying bucktail jigs, Tying your own bucktail jigs on May 22, 2017 by Lure Parts Online.